4.2 out of 5 based on 48 bloggers and 22 commenters. 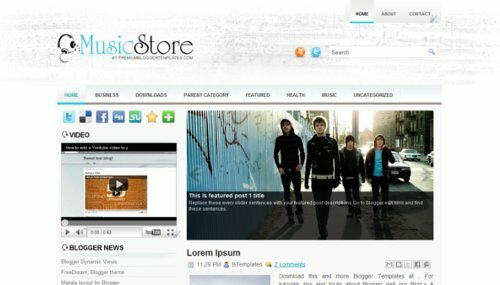 MusicStore is a free blogger template adapted from WordPress with 2 columns, left sidebar, footer columns, slider, posts thumbnails and drop down menu. Excellent template for blogs about culture or music. On the homepage, the images on the posts on IE are very tiny (they’re in a corner and just look like a small bar, we can barely see the image), only after selecting the post the image remains ok. ON firefox it works ok, but 90% of my visitors use IE. 1. Contact the author to report this issue. 2. Remove the “read more” script. If you want to do this, please read here (instructions are the same). Claudia Hola or Hi? English or Spanish? Mira tengo problmas con esto de los templates y su adaptacion a Blogger. Cuando adapto el template a Blogger como puedo agregar informacion a las categorias del menu de navegacion principal, el motor de Blogger no muestra los componenetes. O eso hay que hacerlo via Código??? How can I remove “Read more” ? sorry guys..i try to put html script here but still not working..
Before you include your code, it must be pharsed. You may use this tool. The background images are just dead. Can you please help? Claudia, tamplete used his blog to build the institution’s music, and am having problems with the image of the main menu is a few pictures with black exclamation points, you can help me? También tengo el mismo problema. En mi blog aparecen imágenes con signos negros. ¿Alguna solución? ya I found that all pic links that link to the writer’s blog are broken. I suggest you change the theme. how to show my videos on the homepage? Help. I have a problem with the post. I want the icons MB tf g+ 1 Recommend this on Google, to emganizontai at the end of this post rather than at its beginning. The site is http://www.hwradio.net. Plz help me. Thank you.